Geese, like other waterfowl, can be found pretty much all over the world. Light geese and Canada geese are iconic species for waterfowlers in the USA and Canada; grey, bean and barnacle geese are prized by hunters all over Europe from Russia to Bulgaria; exotic geese species grace the skies of Argentina and South Africa. For the amount of equipment, knowledge and skills that go into this hunt, guided goose hunts are rather affordable. You can find your adventure for well under $200 a hunter a day; this would typically mean a group hunt without lodging. 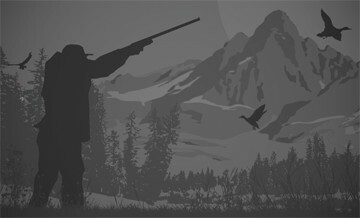 Hunts with lodging on private land and/or in the areas known for abundance of birds may reach $700-$800 a hunter a day. With abundant feeding opportunities provided by modern agriculture, there are now more light geese in North America that the tundra can manage. A special hunting season known as Light Goose Conservation Order was established; it provides an excellent opportunity for waterfowl hunter, but doesn't do much to reduce the numbers of light geese. But why? When to hunt Goose Geese? Goose hunting season in the Northern Hemisphere usually starts in September and targets local populations. It gains tempo when the geese begin their migration to warmer places, and on wintering grounds continues through the winter. Spring goose seasons are open in some Eastern European countries, and in North America under Light Geese Conservation Order. Throw in exotic species in Argentina and Africa, and a goose hunting aficionado may pursue the birds pretty much all year round. Hunting from a blind with decoys and calls is by far the most popular way of goose hunting worldwide. Elaborate spreads of many decoys and artistic calling is usually required to overcome the alertness of large migratory flocks. During a guided goose hunt, choosing the right place, setting the decoys, and In the blind, try be as inconspicuous as possible (as if you’re sitting in an open field), don’t open fire without the command from the guide, and don’t try to kill all birds at once: select one goose and make sure you hit it well. A goose is a big bird, and a delicious one at that. No wonder that many creatures, from grizzly bears and polar foxes to people, would like to dine on one. Centuries of evolution developed in geese extraordinary alertness, eyesight, and collective intelligence: it takes just one educated bird for the whole flock to escape danger. A successful goose hunt is quite a challenge, especially for beginners. A goose hunt with a good guide is the perfect way to start you waterfowl hunter’s career. Get a taste of this exciting adventure with BookYourHunt.com! Half day Goose hunts begin ½-hour before sunrise and end at 11:00 am (or until limits are met.) On our duck or goose hunts, your guides will typically pick you up an hour before shooting time at the predetermined meeting point. This allows plenty of time to get to the spot, set the spread and prepare for the day. We will hunt from legal shooting time (½ hour before sunrise) until 11:00 am. Hunts will either be out of one of our top of the line Bradley pit blinds or our custom 28 ft. duck water boat, determined by the type of hunt you choose. Please specify upon calling the type of hunt and any special requirements you may prefer as we book multiple hunts and would like you to have the option and accommodations you request. Wounded Warrior Excursion: Ever so grateful to the sacrifices our service personnel have given, we are honored to host our Wounded Warriors. We extend a 25% discount to any Wounded Warrior that desires to hunt with us. We consider it an honor to have them with us. (We do require Proof of Service in order to extend this discount) Equipment List: 10 or 12 Ga. Shotgun, with #4, #2 or BB steel shot only (required by law); Warm/Waterproof clothing and/or rain gear (parkas/pants); Gloves and boots (dull colored, brown, tan, or camo is preferable) Please no bright colors! Waterfowl hunting simply does not get any better than this! Located near Chitek Lake Saskatchewan, our hunting area is situated under one of the largest migratory routes in Western Canada. Due to our unique location and the variety of birds, we are able to offer many types of waterfowl hunting. The south end of the boreal forest is the first farmland for waterfowl on their migration south and our area is a favourite feeding ground for waterfowl due to this vast grain-producing region. Loaded with fields of peas, wheat and barley and thousands of potholes, every September through October, a variety of geese including Canada’s, Cacklers, Specklebellies, Snow and Blues as well as Mallard and Pintail Ducks grace this region. (Not to mention the local ducks and geese that nest here yearly). Saskatchewan waterfowl hunting is world famous for a reason and we would love to help you experience it firsthand. We pride ourselves on offering our clients a high quality, organized, professionally outfitted hunting experience by using top notch gear, working hard, scouting daily and hunting one of the very best waterfowl hunting areas in all of Canada. Bag limits: - Dark Geese (Canada, cackling and white-fronted geese) daily limit: 8 (only 5 may be white fronted). Possession limit: three times daily limit - White Geese (white and blue phase snow geese and Ross' geese) daily limit: 20. Possession limit: no possession limit - Sandhill Cranes daily limit: 5. Possession limit: no possession limit - Ducks Daily limit: 8 (only 4 may be pintails). Possession limit: three times daily limit. - Coots and Snipe daily limit: 10 (each species). Possession limit: three times daily limit.